FILE - Members of forces loyal to Libya's eastern government stand near to the Libyan cement factory after the army took control of the factory following clashes with the Shura Council of Libyan Revolutionaries, an alliance of former anti-Gaddafi rebels who have joined forces with Islamist group Ansar al-Sharia, in Benghazi, Libya. Libya's new government and its security challenges are the focus for diplomats Monday as they gather in Vienna to discuss the situation in the country which has been grappling to overcome the chaos that followed the 2011 ouster and killing of leader Moammar Gadhafi. U.S. Secretary of State John Kerry and Italian Foreign Minister Paolo Gentiloni are co-hosting the session aimed at supporting the Government of National Accord that Western powers hope can unite Libya. The internationally recognized government is facing challenges from rival factions. The new government is also being challenged by Islamic State-affiliated militants who have established a base in the central city of Sirte and have used that base to launch attacks in neighboring Tunisia. FILE - Armenian soldiers pose near a frontline in Nagorno-Karabakh, Azerbaijan, April 6, 2016. All of the participants in Monday’s ministerial meeting would likely agree that Islamic State is a “huge problem for Libya and the region,” said a senior State Department official. “Libya is a keystone for access to the Sahel, the Maghreb, the Near East and the Mediterranean and Europe and to have Daesh have a foothold in Libya is bad for everybody,” said the official in a Friday briefing. Another focal point for Kerry Monday is a multinational effort to help stabilize Nagorno-Karabakh, an ethnic Armenian enclave within Azerbaijan that was the scene of intense fighting in April. The U.S., Russia and France serve as co-chairs of the OSCE (Organization for Security and Cooperation in Europe) Minsk Group, which has been working to find a peaceful solution to the Nagorno-Karabakh conflict. Additionally, separate talks will be held with the presidents of Armenia and Azerbaijan. The talks in Vienna follow Kerry's visit to Saudi Arabia where he sought that government's support in strengthening a cessation of hostilities agreement between Syrian government forces and rebels ahead of broader talks on Syria. Tuesday, the 17-nation International Syria Support Group (ISSG) will convene in Vienna to discuss the stalled political talks, difficulties in maintaining the February cease-fire and the U.N.'s uneven results in delivering humanitarian aid. 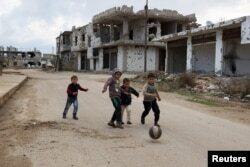 FILE - Children play near damaged buildings in the rebel-held southern town of Bosra al-Sham, Deraa, Syria, Feb. 23, 2016. “Not all of the trend lines in Syria are going in the right direction,” said State Department spokesman John Kirby on Friday. U.N. Syria envoy Staffan de Mistura has indicated he will await the results of the ISSG meeting before setting a date for the next round of proximity talks between the government and the opposition. In addition to Vienna, Kerry will attend a NATO ministerial meeting in Brussels and then will travel to Burma in a show of U.S. support for the country’s newly elected government. In the following week, Kerry will join President Barack Obama in Vietnam.